You COULD be making a lot more money, ya know. In fact, with just a few simple little tweaks you could experience EXPONENTIAL increases in your income… pretty darn fast, too. Just double your lifetime customer value. EXPONENTIAL increases in your net! Getting a new customer is the most expensive and least profitable marketing you do. Many businesses actually LOSE money to get a new customer. So if that customer doesn’t stick around very long and buy more products, you wind up making little to no money. Not exactly the formula for a profitable business, right? But what if you’re able to keep that customer sticking around a lot longer, making more and bigger purchases? That means a LOT more cashola in your pocket. And lucky for you, I’ve discovered a few simple and inexpensive things you can start doing right away that can double (or maybe even triple) your LCV. I’m amazed at how few business owners express their appreciation for their customers. Maybe you didn’t realize it but your customer is the reason you’re in business. Without him or her you very well may be living in a van down by the river! It’s amazing how well these letters work. 1. The stick letter is actually a sales letter. It sells your customer (again) on why they made the purchase in the first place. And THAT helps reduce buyer’s remorse, one of the biggest causes of refunds. 2. It lets the customer know you really care about them and appreciate their business. Here’s how important I think it is to send a stick letter. I was in such a hurry to travel to Colombia last month I forgot to leave my special stick letter paper and envelopes with my gal Friday who helps with fulfillment for The Doberman Dan Letter. You see, I absolutely INSIST a specially formatted stick letter goes out to each and every new subscriber to The Doberman Dan Letter. And I insist that it go out the very day we receive the order… or if the order comes in after [5:00] PM then it goes out the very first thing the next morning. I’m not doing this just to be a nice guy. These stick letters (when done using my special techniques) really make a BIG difference in customer retention and LCV. Several new subscriptions came in while I was down in South America and my gal Friday didn’t have the materials to send out the special stick letters. Rather than waiting to send the stick letters until I got home (that would have been a costly mistake), I went to Office Depot in Colombia (yeah, they even have those down there) bought a printer, bought my specialty stick letter paper and envelopes… and invested almost $100 EACH to send the stick letters to the U.S. and Canada via UPS international overnight. Almost NOBODY does anything like this. It hits the customer completely off guard. Sure, they expect you to send the product they ordered… but they sure as hell don’t expect a personal letter from the owner, telling them how much he appreciates their business. Of course I’m simplifying things a little for the sake of brevity but the stick letter is just one part of my entire LCV-increasing strategy. But it’s a really important one. Your Profits Go Through The Roof! I’ve seen businesses experience a 1,300% increase in sales… in only 5 months when all this stuff was implemented according to my instructions. 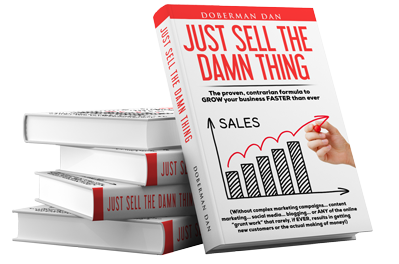 And it just so happens that in the October and November issues of The Doberman Dan Letter I’m revealing many of the secrets that caused that kind of exponential growth in one of my businesses. In addition, the November issue includes numerous examples of the kind of LCV-doubling stick secrets (and a couple stick letter “swipes”) I’ve been talking about. Look, you’re investing a LOT of time and money to get new customers… so doesn’t it make sense to invest a tiny bit more to maximize LCV and KEEP those customers as long as possible? the cashola faster than you can possibly spend it! THAT is when business is fun. So let me help you make more cashola and have more fun doing it, too.